URBANA, Ill. – Corn naturally tolerates certain herbicides, detoxifying the chemicals before they can cause harm. It’s what allows farmers to spray fields with the class of herbicides known as HPPD-inhibitors, which kill weeds such as waterhemp and Palmer amaranth and leave corn unscathed. But in more and more fields, the method is failing; waterhemp isn’t dying. 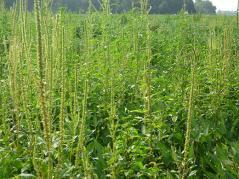 The article, “Metabolic pathway of topramezone in multiple-resistant waterhemp (Amaranthus tuberculatus) differs from naturally tolerant maize,” is published in Frontiers in Plant Science [DOI: 10.3389/fpls.2018.01644]. In addition to Riechers, Anatoli Lygin, Shiv Kaundun, James Morris, Eddie McIndoe, and Andrea Hamilton co-authored the paper. The work was supported by Syngenta Ltd.